I took my time and carefully tried 8 sample t-shirts before finally deciding on the Tee Jays Sof-Tee in white. 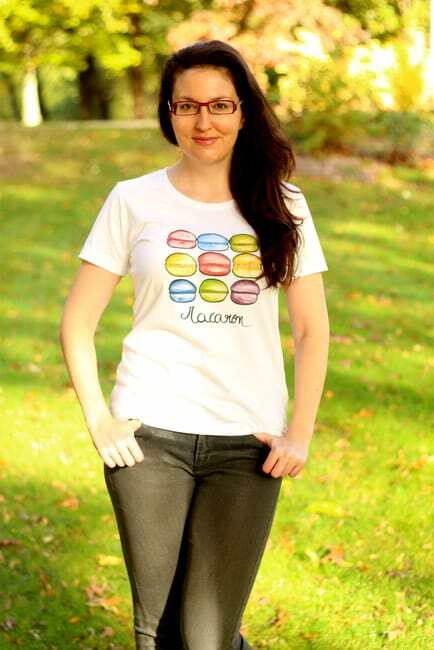 All of my designs are printed on this flattering, relaxed fit, high-quality 100% cotton t-shirt. It's made of soft long fiber ringspun combed cotton and is double preshrunk. I offer S through XL. The brand does not offer XS. I selected the Tee Jays Sof-Tee because I feel it's just as high-end as the designs themselves and works with many body types. It's flattering to a woman's shape without being clingy, narrow or overly revealing. It's body-skimming but somewhat relaxed in the fit as you can see in the photos. It's also long enough to cover your stomach. The shirt drapes nicely but isn't boxy and feels nice on. The cotton is soft and 185 g/m2 meaning the shirt isn't flimsy but isn't as thick as blanket either. Oui In France t-shirts are on par with what you'd find from popular women's brands. My ordering advice: Order your normal t-shirt size. I am normally a medium in t-shirts from mainstream brands and am wearing a medium in all the photos you see on the site. The t-shirt fits true to size, so order your normal size if you like the fit in the photos. If you are in the USA and still really stuck on what size to buy and are often between sizes, I recommend that you buy both sizes and then contact me for a US address to return the shirt you're not keeping (buyer pays shipping). Then once my helper receives the shirt, I can refund you. To keep your shirt looking beautiful and bright for years to come, wash it machine wash cold and inside out to best preserve the print. The design will tone down ever so slightly -- this is normal -- during the first wash and then will be preserved for hundreds of washes to come. The shirt is double preshrunk but best to wash cold and lay flat to dry or tumble dry low if that's not an option. Do not iron over the top of the print.